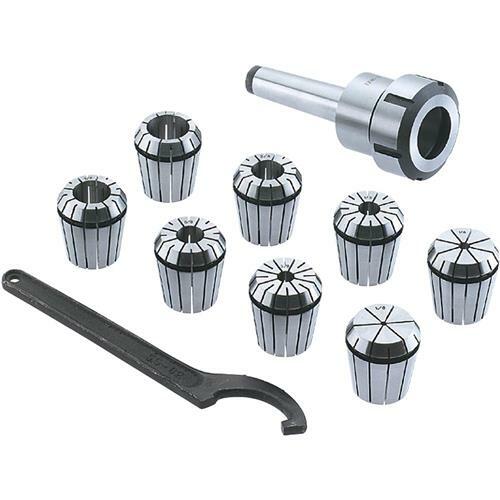 Finally, an affordable quick change collet system with ultra precision! These spring collets are hardened and ground to exacting tolerances and offer incredible holding power. The kit includes MT#8 arbor and nut, spanner wrench, plastic carrying case and collets sized 1/8", 1/4", 3/8", 1/2", 5/8", 3/4", 7/8" and 1". What's more, the nut features a self ejecting rim! A set like this will truly speed up any tool changing process. Drawbar size 3/8-16.